Picking a good punching bag for your training can be quite challenging. You have a good punching bag; then, you can really develop and hone your striking skills. However, having a bad punching bag can ruin all your training mood and keep you staying unfit. Hence, we’ve reviewed the top and best punching bags to find out the main points they share together. For those who still have concern on why you should pick up a punching bag for your home office, make sure you take a good at the benefits before you proceed reading this. The first question you should ask yourself is what type of heavy bag you need: a free standing bag or a hanging heavy bag. Both of them share pros and cons. The Hanging bags provide a better striking experience and tend to move around when struck, so they can help you work on your timing, speed and accuracy. The price is cheaper than the free standing one. However, you may find it hard to set up and need a ceiling that can support the weight, and the bag can hardly be moved after setting up. And what about the free standing one? Of course, it is easy to move and can be set up in any room. You just simply roll it out out of the way when your work with it is done. However, this bag is not as sturdy as hanging bags and hard strikes can make the bag move. Now we’re talking about the weight. Choose a bag too light and it could go flying with a powerful kick. But choose a heavy bag too heavy and throwing punches or kicks can hurt your hands and legs. The rule of thumb is choosing the bag that is half your weight, give or take a few pounds/kilo. You can choose a much heavier bag if you are an experienced martial artist or you have powerful strikes. What about the filler materials? Generally, MMA training bags are made from fiber (synthetic and natural), foam, sand or water. Fiber is commonly used nowadays. It provides a nice even resistance throughout the bag. No matter how many times you train, the experience is likely to be the same. Foam is usually used by top martial artists. It usually provides a consistent striking experience and it doesn’t settle, so you don’t need to worry about bottom of the bag becoming stiff. Sand can occasionally settle on the bottom, which can make the bottom of the bag a little harder to hit than the top. Last but not least, it’s water. Water, by most people, believes that it provides consistent experience and feels more natural to strike than any other bag. But kindly keep in mind that each person shares different preference. It is easier said than done, of course. The guide above simply introduces you to the world of punching bags. You really need more than that if you are just a newbie to this world. Hence, we took the liberty to collect the top ten best heavy punching bags in 2019 just for you. 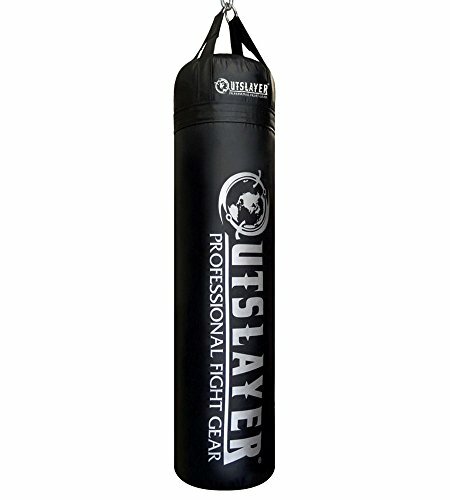 One of the best heavy bag stands on the market is the Outslayer Muay Thai Heavy Bag stand. Made out of heavy duty vinyl that we also use for custom 300lbs bags, this stand gives you space to move around the bag and work on your angles. It comes 6 ft tall to ensure that you can place any sized heavy bag on the stand without any issues. The inside is only filled with compressed fabric, no sand. The material allows you to add extra weight to the bag if you like, up to 300lbs. The Outslayer heavy bag stand comes with four unfilled bags that you can add to the base of the station. This will prevent the stand from moving when you strike it. The assembly of the stand is very straightforward and easy. You no longer need any chains since it’s designed with heavy duty straps. Heavy duty D-rings have extra padding to prevent flipping of the rings. If you would like a D-ring on the bottom of your heavy bag, to secure to the floor or sand bag, feel free to contact the manufacturer ahead before you order. CardioBlast Bag combines a lightweight technical outer shell with impact dispersing stuffing for the ultimate in dynamic cardio training. Its 40lb size allows for easy handling, while 40″ bag length allows for versatile training to accommodate punches, knees, and kicks. Durability and functionality are delivered incredibly amazing with the premium synthetic leather with reinforced webbing along with superior heavy bag construction. This bag is designed by not using sand to create softer feel for cardio and conditioning work. Everstrike technology is a woven, textured lightweight synthetic material engineered for maximum durability. It has the length around 55” with a 11.5” in diameter. This length makes it suitable not just for throwing punches on it but high kicks and knees as well. However, it is not ideal for low kicks if you do Muay Thai. 120 days from the date of purchase is the warranty period of defects in materials and workmanship. Everlast’s sole liability is limited to repairing or replacing products that are returned within this 120-day period, unless specific product literature specifies otherwise. Everlast CardioBlast bag is a ​starter heavy bag that provides a good user experience. Perfect for cardio workouts. 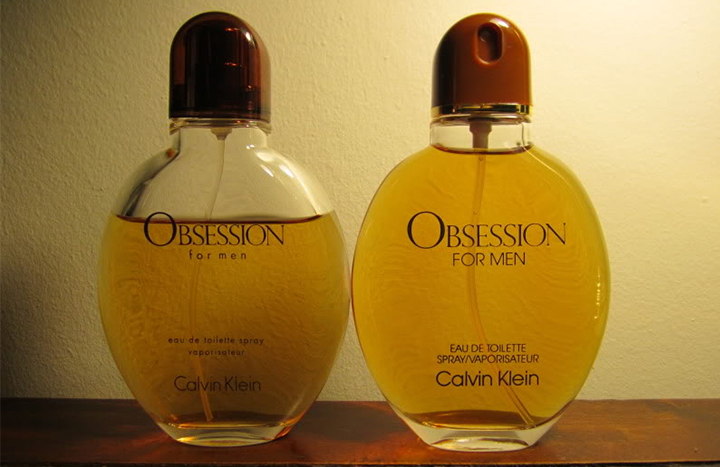 But, because of it is lightweight, it is mainly suitable for women. Ringside brings the best for you in their Powerhide Thai Heavy Bag, one of the most used pieces of equipment in your gym. This solid bag made of resilient powerhide construction will hold up to your most powerful assault in your home or commercial gym while covering ensures an attractive, well shaped bag that will consistently make you come back for more. Its covering provides a well-shaped and a handsome bag. Soft 2″ foam liner offers a comfortable hitting surface. It ensures one does not get sore knuckles and aids in reducing muscle strain on wrist, shoulders, and elbows. The ideal shell material for a heavy bag is leather. Due to its natural material, it is extremely durable not unless it’s not correctly stitched or its light. A supple and consistent feeling is brought to the fighters when they punch it. However, leather is usually more expensive. It comes with a synthetic material which has its benefits. This material is perfect for those who want to take outdoor workouts because it resists weather, especially moisture or water as better than leather. This casing ensures that there are no tear and wear beside surface scuffs. 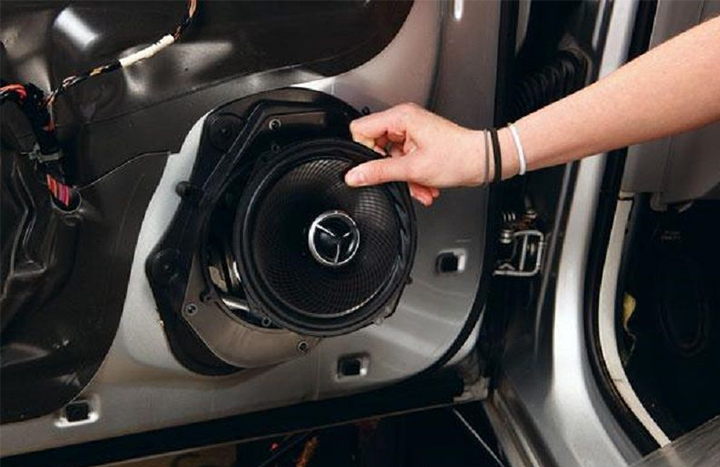 It ensures that the internal materials stay intact even after impact. Also, the seams are solid and tight which make you feel comfortable in punching. Designed for boxing practice, this is the best heavy duty punching bag for people who want to customize their heavy bag so they can enjoy a personalized level of training according to their unique needs. The Lastworld New Heavy Vinyl Punching Bag is 17 inches wide, offering a great striking surface that withstands the force you unleash on it. After punches and kicks, the bag won’t give up on you easily, as it can take repeated beatings, kicks and punches. Extra heavy duty stitching comes along with the bag to ensure the best durability ever brought to a punching bag. Feel free to fill the bag up with any material you choose including rags, plastic bags, cotton, old clothes, etc. The freedom to set the resistance level to your preference ensures that you can comfortably use the bag since you know what is inside, so you can subject it to the kind of beating that will match the material you have filled it with. The bag is 54” long with chains and 41” without chain. Offering high quality at low cost, the Lastworld New Heavy Duty Punching Bag is not the same as other heavy bags found elsewhere. 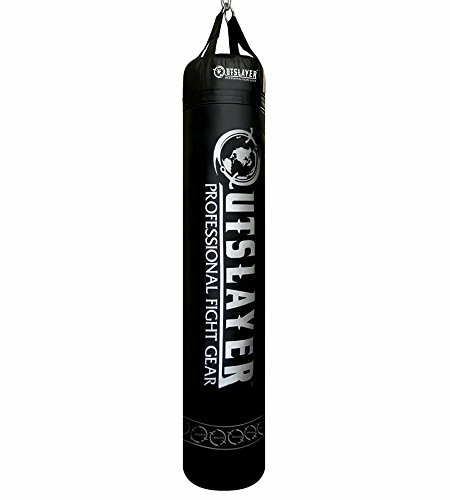 Outslayer Boxing MMA 100lbs Heavy Bag is built with a heavy duty vinyl shell. At the top they stitch the four hanger straps a food 10-12 inches down the top of the shell and reinforce them with another strap wrapping around the diameter of the bag. The bag comes prefilled with hydraulically compacted materials that provides a really nice striking feel. Enough resistance comes with its firmness but not too hard to be uncomfortable. Unlike other cheap heavy bags, there is no sandbags inside that can shift around over time. You also also notice it has even density for a nice center of gravity in the middle of the bag while punching. It swings smoothly without the bouncing you can get on a bottom weighted heavy bag. The quality vinyl materials, compressed filler, and 10 year warranty of this bag earns our highest recommendations. Factor in the 10 year warranty, made in the USA, and the Outslayer heavy bag is an excellent choice. 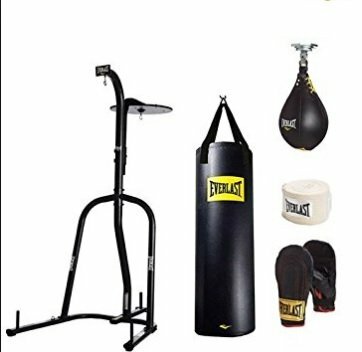 For those who own gym as well as people looking to add a punching bag to their home gym, you are looking at the right item. As you will see, the quality you get for the price is what sets Outslayer apart from the rest. 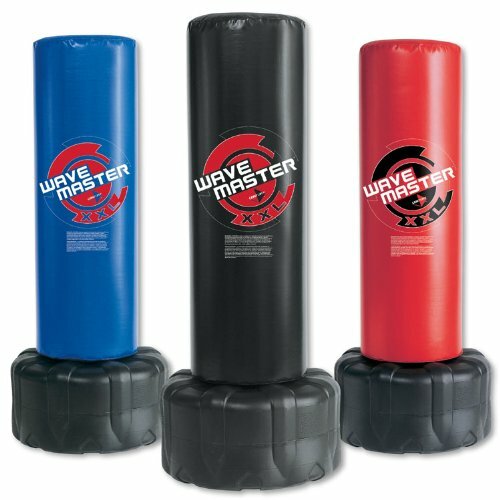 Unlike others, Wavemaster free standing punching bags have several advantages. First, you don’t have to waste much space since they do not swing. 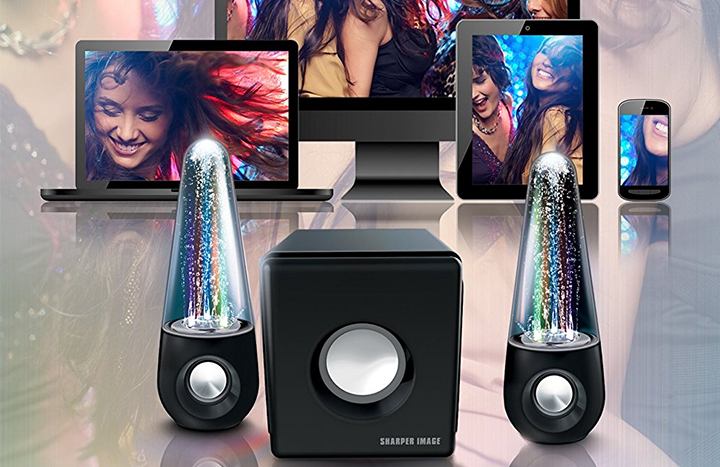 Second, the set up takes only a couple of minutes they do not require a hanging apparatus or any modification to the room. You don’t have to worry about the bag falling from the ceiling due to improper installation. They can be easily moved since they come in round bases which good if you don’t have a set space for your training equipment. 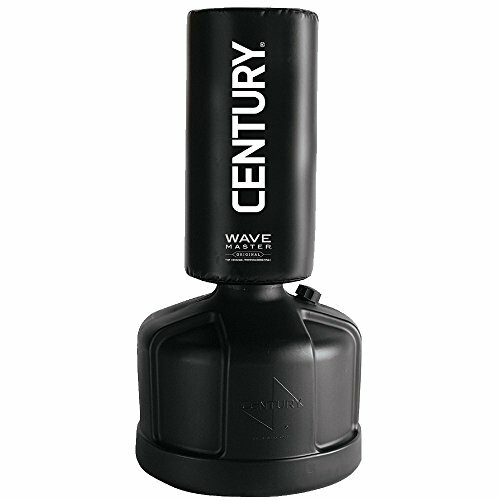 Century Aerobic Wavemaster is a free standing bag that comes with high-density foam filler and a strong vinyl cover. Low profile base fills with sand or water and is rounded for easy roll relocation. It’s smaller than ordinary bag since its diameter is 10.5 inches. INcluding the base, it weighs 170 pounds. You might wonder why the bag is smaller than usual. The reason is the Century Aerobic Wavemaster is particularly designed for cardio work and not for developing strength or power. This punching bag is very sturdy and it handles a lot of action without showing signs of wear and tear and more forgiving since it allows users who are shorter in height to use it in the most efficient manner. The Everlast 100-lb Heavy Bag Kit brings up the best durability and functionality along with the Dual Station Heavy Bag Stand and a durable 100-lb Nevatear heavy bag with reinforced webbing and excellent heavy bag construction. Whether it is 1 hour or 1 day, the bag can easily withstand long hours of practicing without a problem. The set also includes leather bag gloves with padded palm grip which provide excellent stability. 100% cotton hand wraps are included in the Nevatear heavy bag to make the bag breathable, supportive and comfortable, ensuring good grip. Since it comes with the adjustable heavy bag chain, the Everlast punching bag can be conveniently hung from a pipe or a hook. It is pre-filled and ready to be used upon delivery. Whether you want to practice your punches for a fight or simply exercise at home, the heavy punching bag will make a good choice for every boxing enthusiast. Like other stands, there are 3 pegs on which to put weight plates to add stability. Well constructed, the stand is built to last a long time. Using a bag on this stand is ideal for developing power and training endurance, however like most heavy bag stands it limits the ability to work angles and footwork, as the striker does not have access to the full 360 degrees of the bag. 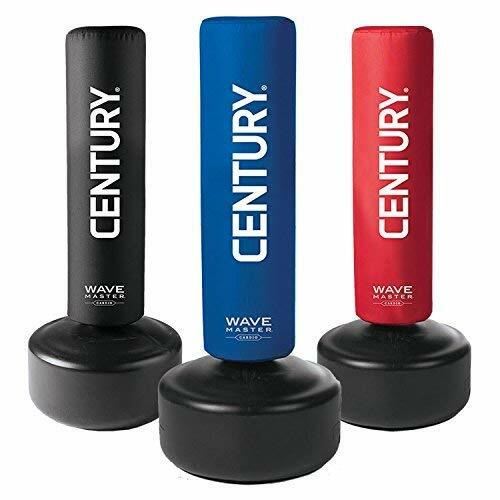 The XXL is a very popular free standing heavy bag made by Century MMA. Constructed in high-density foam, the bag comes with a heavy-duty vinyl cover and a hard plastic base, which can easily be filled with water or sand. The foam filler is designed to distribute force evenly, which makes the bag relatively forgiving when punching and kicking. This XXL as three great colors, including red, blue and black which is unlike the other bags that only come in black. The bag weighs roughly 270 pounds including the base. With a diameter of 18 inches and a height of 69 inches, the XXL is easily one of the largest free standing heavy bags available on the market today. Another reason which makes this punching bag great for both recreational users and also serious martial artists and fighters is its superior stability. As it can easily be rolled out when needed and then put away when the class is done, XXL is also excellent for cardio-based exercise. With adequate space, a fighter can practice drills using their footwork with an emphasis on circling or angles against a stationary target and then apply these drills in sparring practice or in fights. As you may have implied from its name (original), the Century The Original Wavemaster Training Bag is one of the first designs in a series of free-standing heavy bags from Century. You can fill in either sand or water in the large base which offers a sturdy foundation for fairly substantial strikes. Height is also adjustable. You can raise or lower the striking surface to practice different techniques as well as customize it for your specific style. It’s vinyl cover and foam filler provides a durable striking surface and ample cushion. You don’t notice much rocking since the base is low enough to the ground and heavy when struck with a normal training force. The smaller base makes it more portable as well as versatile since you can move the training bag where you need it and work on footwork by dancing around it. However, this bag is not really designed for large, more experienced fighters as it does rock significantly with force. Another cool part about this bag is its portability and convenient storage. You don’t need to drill holes in your ceiling or buy a heavy bag stand like you do with a traditional hanging heavy bag. This bag is perfect for those who are just getting started with training with a punching bag or a heavy bag (aka beginners). The adjustable height allows for great versatility so you can train punches, speed, footwork, kicks and grappling. 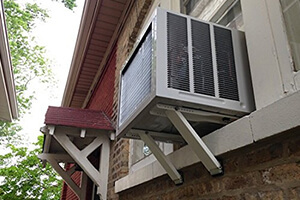 It is also good for those who rent a house or apartment since it doesn’t require drilling or mounting in anyway. 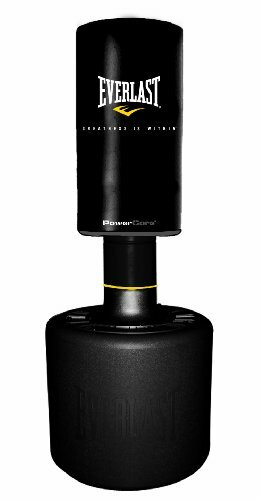 Last but not least, the beast you should consider when you’re searching for a freestanding model of a heavy punching bag at a reasonable price for home use is the Everlast 2228 PowerCore Freestanding Heavy Bag. Not only ideal for kicking but it can also be used for punching training as well due to its double facing bags. The improved design allows for more strength to be built and ease the process of assembly. You do not have to call a mechanic to assemble it for training once the model arrives at your doorstep. It offers quite ease of assembly so that you can assemble the model yourself. This Everlast Punching bag delivers maximum energy dispersion so that you can train with full power and strength. Thanks to its new and advanced tri-disc support. The Power Transfer Ring Collar allows the bag to offer excellent recoil and better impact and absorption for an incredible kicking and punching experience. Along with the other incredible features, the installed Power Core steel plate improves the overall strength making it more durable and ideal for training. Such a plus, it is now available with a compact base. With all these features coming in a package, the price is very reasonable. Training is absolutely beneficial to your life. Having a punching bag in your home or garage can be your lovely and long-lasting companion everytime you feel stressed, or tensed. It’s time for you to make the decision now. Feel free to go over each item again. Just keep in mind that you are only one click away from being the owner of one of the best heavy punching bags of 2019.